Magnetic resonance imaging (MRI) is the most advanced imaging technique used in veterinary medicine. MRI provides detailed images of internal structures and reveal subtle abnormalities that cannot be identified with radiographs or CT scans. 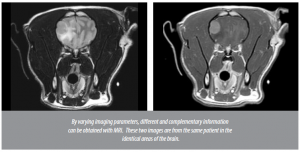 In some disease processes, MRI is the only imaging technique that can permit an accurate diagnosis. It is also the safest imaging modality for can evaluation of the spinal cord. 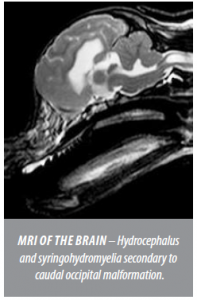 MRI is considered the gold standard of diagnostic imaging for diseases of the brain and spinal cord. Is MRI Safe and Comfortable for My Pet? MRI is a safe and non-invasive procedure that does not cause any pain or discomfort. Unlike a CT scan, no ionizing radiation is utilized during an MRI. An MRI uses a strong magnet and radio waves to generate highly detailed images of internal anatomy. How Do we Prepare Prior to the MRI Procedure? In veterinary patients, MRI must be performed under general anesthesia which necessitates withholding food for at least 12 hours prior to the scan. What Happens when I Bring My Pet in for an MRI? The time required to complete an MRI study will vary. We will try to provide an estimation of the time required to perform the scan at the time your pet is admitted. You will be asked to admit your pet the morning the MRI is scheduled if your pet is not already hospitalized. We will contact you when the procedure is complete. If you leave MedVet while the procedure is performed, please provide our staff with a contact telephone number. You are welcome to wait at MedVet during the procedure, but your pet may not be ready to be discharged for several hours. You will meet with a member of the MRI team, who will answer any questions you have about the procedure. Your pet will then be admitted to the hospital for the day and preparations for the MRI will begin. If needed, a mild sedative will be administered to calm your pet for catheter placement. A small amount of fur will be clipped to facilitate placement of an intravenous catheter for administration of anesthetic agents and intravenous fluids. Anesthesia is required because the patient must remain completely still during the procedure in order for clear images to be acquired. An additional small area of fur will be clipped from the chest where an ECG pad will be placed. The ECG will allow your pet’s heart rhythm to be monitored throughout the procedure. Your pet will be anesthetized under the direct supervision of a board certified veterinary anesthesiologist, then placed on a padded comfortable table. This table will slide into a chamber which is surrounded by the magnet. The scan is performed under the direction of a board certified MedVet radiologist. Following the MRI your pet will be moved to a warm, comfortable recovery area. Your pet may go home once completely awakened from the anesthesia. When your pet is discharged, MedVet staff will discuss at home care. A final written report from the radiologist will generally be available in 24 hours and will be reviewed with you by your primary care veterinarian. Since a final report of the MRI will not be available at the time your pet is released, the staff member will not be able to discuss the results with you.